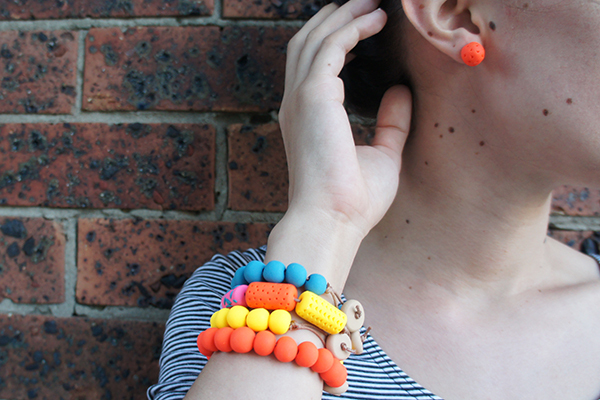 FK chats to the lovely Therese of colourful Sydney based jewellery label Ena & Albert! Tell us a bit about Ena & Albert and what products we can expect to discover? 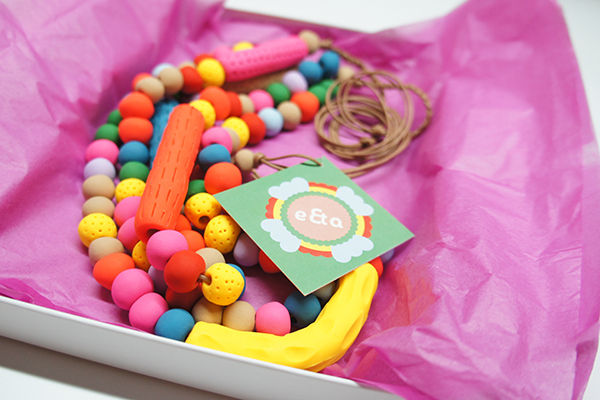 Ena & Albert aims to bring colour and fun to your everyday life through quality, handmade goods. 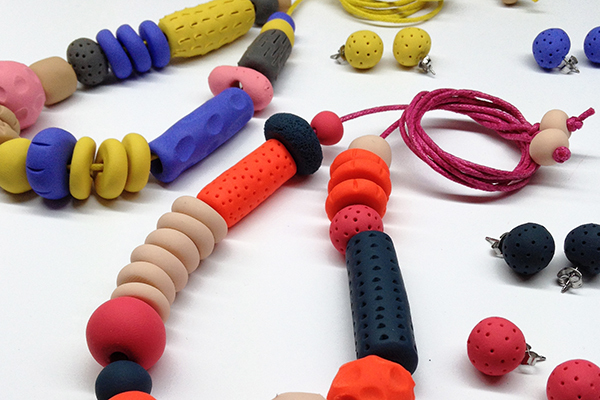 Created by me, Therese Lyons, the current range consists of gelato and fruity hued necklaces, bracelets and earrings. 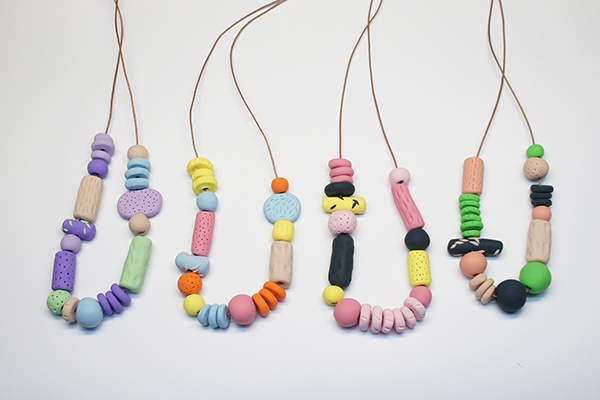 Each piece is lovingly shaped and textured using polymer clay in my Sydney studio to create what I like to think of as wearable pieces of art. E&A also offers custom jewellery pieces where I work with the customer to create something special just for them. My hope is that an E&A piece of jewellery will bring a smile to your face. I’ve always been a maker. I joke that I could sew before I could walk and while that’s probably not quite accurate, it is definitely true that I have always been happiest while making. My earliest memories are of making clothes for my dolls by hand stitching scraps of fabric together. 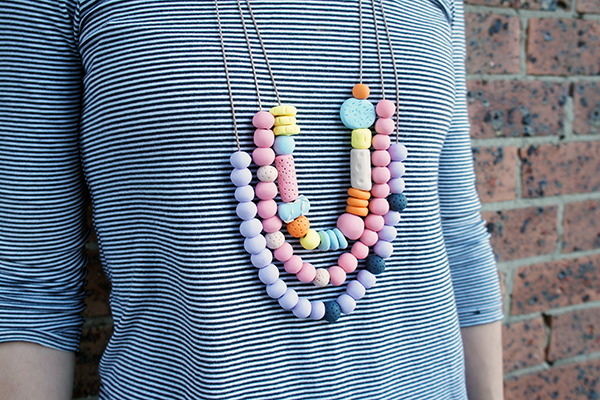 I’ve continued to create everything from jewellery to softies to homewares and my own clothing and also have a Bachelor of Creative Arts in Textiles. Over the last few years since graduating, I’ve been finding my place in the creative world and E&A is my first big step in. Instagram! I am unashamedly obsessed with it. I love to follow other creative people and see what they are up to and this app has made this so much more accessible. Often I will be inspired by the colours of an artwork, the shape of a handmade vase, the texture of a beautiful weaving or the even just being inspired by others’ inspiration. A few amazing people I follow are alfalky, polkaros, antipastel, alexlouisa_, upthewoodenhills and houseofmaryanne, but there are so many more! I’m also inspired by colour palettes in homewares magazines, bouquets of flowers, Japanese craft books and fashion trends. I work in Surry Hills which is a great place for fashion watching! I like to look at women’s outfits and think about how E&A jewellery would suit their style. Organised clutter! I’ve converted the second bedroom in the apartment I share with my very supportive boyfriend, into a studio. I spend most of my time in here but have been known to move work around the house and create a bit of a mess! I’ve been collecting craft supplies for years and so I’ve got shelves spilling over with books, fabrics, ribbons and papers. I’ve taped inspiration pictures cut from magazines, collected business cards and postcards, beads, yarn and paint chips around the walls. I’ve got half finished and completed craft projects littering the place. 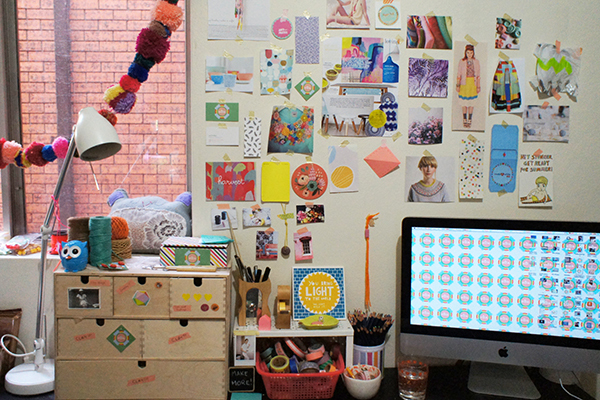 My desk is covered with collected objects, coloured pencils, washi tape and other colourful bits and bobs. I can’t help but be inspired in here! 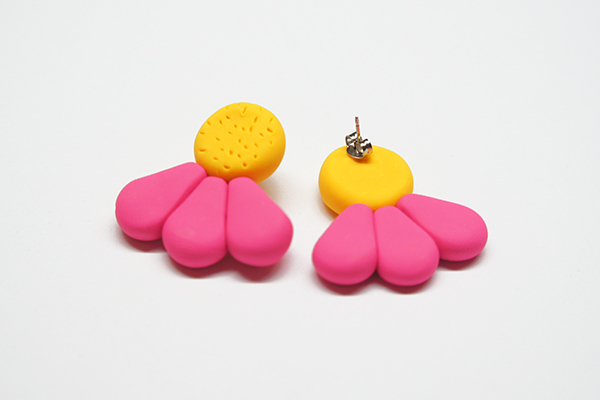 What do you love about working with Polymer clay? And what are some of the challenges? I has been making jewellery as a hobby for about 10 years before E&A, buying beautiful beads from all sorts of places but always wanting something different. 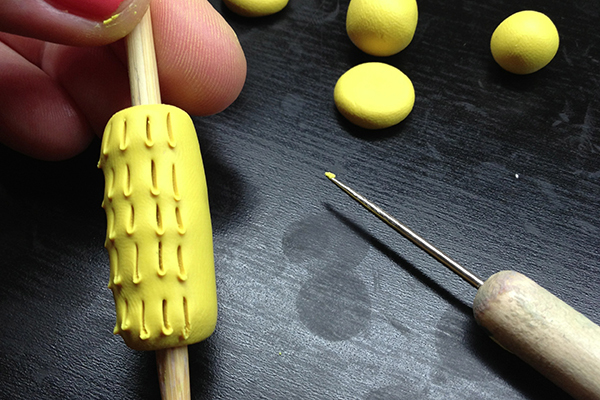 What I love about polymer clay is that I can now create my own beads. Whatever shape, size, colour or texture I want, I can do it by experimenting with mixing colours and using different objects to make marks on the clay. I guess the biggest challenge is that polymer clay is so popular right now, which has made me hesitant in the past to use it. I’ve come to the realisation that it’s just like if I were working with resin or silver, there are always going to be other amazing people working with the same medium. It’s now up to me to make sure E&A stays fresh and creates its own trends. What new plans do you have for Ena & Albert this year? It may not always be the case but at the moment for E&A it’s all about jewellery. My sketchbook is quickly filling up with new designs for the rest of the year, mostly centered around necklaces. I’ve actually just returned from a holiday in Japan, where I’ve sourced some amazing yarns which are going to play a big part in some new pieces, due to launch over the next month or two. You can expect more colour and even more texture! Yay! I love Ena & Albert! So many pieces that would be perfect with my wardrobe! Another lovely feature, FK!